Fabulous Elevation dress which has amazing stage presence, enhanced by hundreds of swarovski AB dimantes for maximum sparkle and impact. 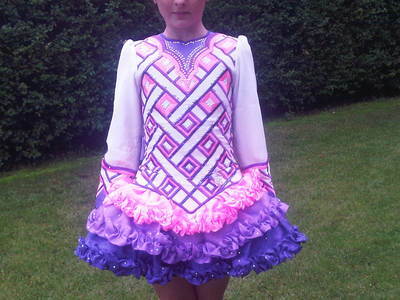 The soft skirt is lightweight to allow for greater comfort during stage performance. Underneath the skirt there is a purple tutu which give the skirt fullness. Made for championship level dancer, very up to date style, from a smoke free./ pet free enironment. The dress is is odour free and has been kept in immaculate condition. 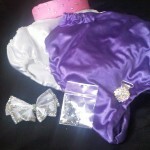 Includes two pairs of kick pants, a dimante alice band, a diamante number clip, a white swarovski hair bow and a bag of extra swarovski dimantes. There is room for let down in the skirt.